Weapon Shop Flyer is one of the information archives in Nier: Automata. Accord's is a thriving chain of weapon stores with over 140 locations across the world. We feature a fantastic selection of goods, including swords that match the regional features and squads of each country! 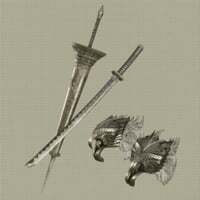 In addition to newly developed equipment, we are technologically unrivaled when it comes to taking ancient blades and making them ready for use again. We proudly invite you to explore the wide variety of weaponry born of the skillful handiwork and extraordinary passion of our founder, Accord. We appreciate your continued support, and look forward to serving you in the future..
City Ruins - Locked Chest: Located at the bottom of the Canyon, next to the regular chest with the Phoenix Dagger. Accessed in quest Lord of the Valley.